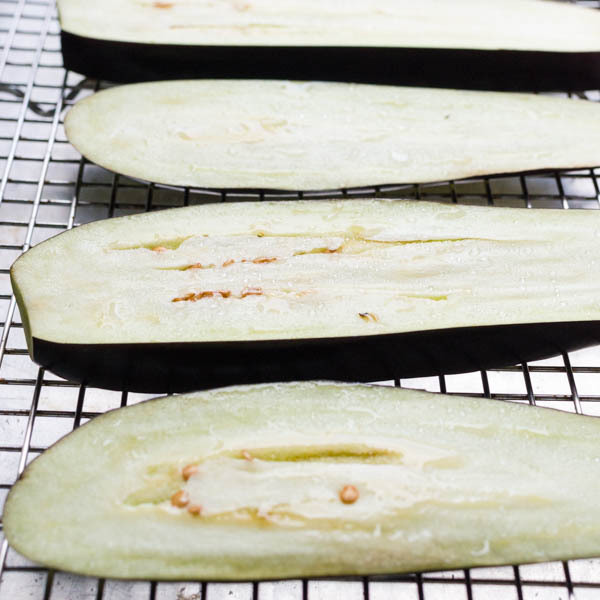 Here’s a quick eggplant recipe that will delight even the most stubborn eggplant naysayers! 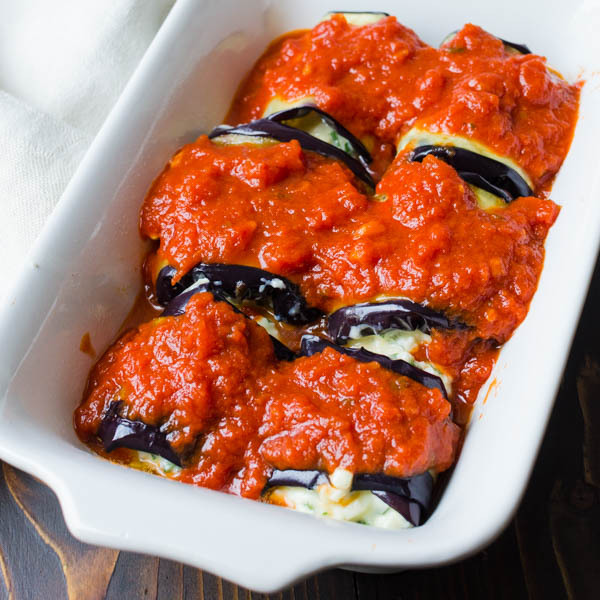 This eggplant side dish is healthy and simple to prepare and my Eggplant Rollatini Recipe is ready in under an hour! I’ll be the first to admit that I’m not a big fan of eggplant, which is why this Eggplant Rollatini recipe being made by me in my own kitchen would seem absurd to my 10-year old self. My loathing dislike for eggplant stems from my mother’s ratatouille when I was a kid… The vegetable yield from her garden assured us that we would never go hungry — and in order to preserve her harvest, she made her ratatouille recipe with loads of eggplant in quantities that would feed the NFL. Then she’d seal them in those quart sized Ball canning jars, sink them into a boiling bath until they “popped” and display them on a custom shelving unit designed and built by my father — solely for the purpose of torturing me storing her bounty. Consequently we rarely had a meal that didn’t include her ratatouille. 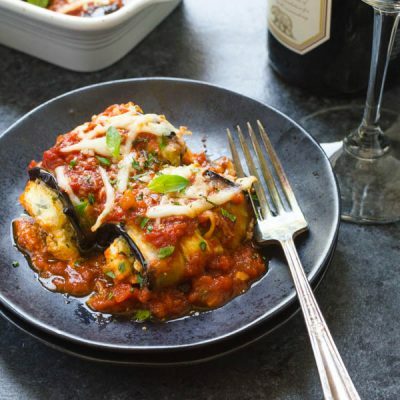 For more baby steps, you can serve this grilled eggplant rollatini recipe on the side with a piece of roasted chicken, but it’s substantial enough to act as the main course in my opinion. Serve it with a sprinkle of fresh basil and mint and extra cheese and marinara sauce if you like. 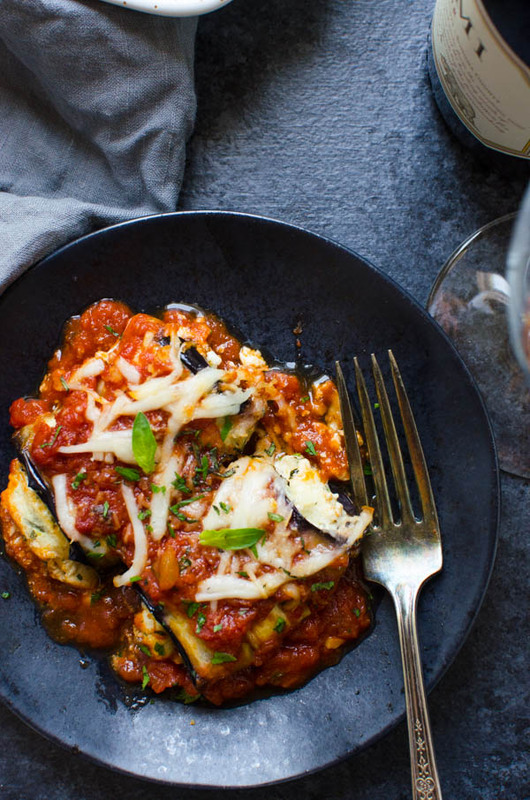 Tender pan grilled eggplant filled with a savory herb and cheese blend topped with your favorite marinara. Makes a great vegetarian main or delicious side dish. Preheat the oven to 375°. Spray a small casserole dish with vegetable spray and set aside. Cut the stems and heel of the egg plant, then slice the eggplant into 1/2" thick slices from root to tip. Place the slices on a wire rack sitting on a sheet pan. Sprinkle with kosher salt and let sit for 15 minutes. Flip the eggplant and sprinkle the other side with salt and sit for another 15 minutes. Rinse the salt off the eggplant then dry thoroughly with paper towels. Heat a large griddle pan over medium high heat. Add the olive oil and turn the pan to coat with the oil. 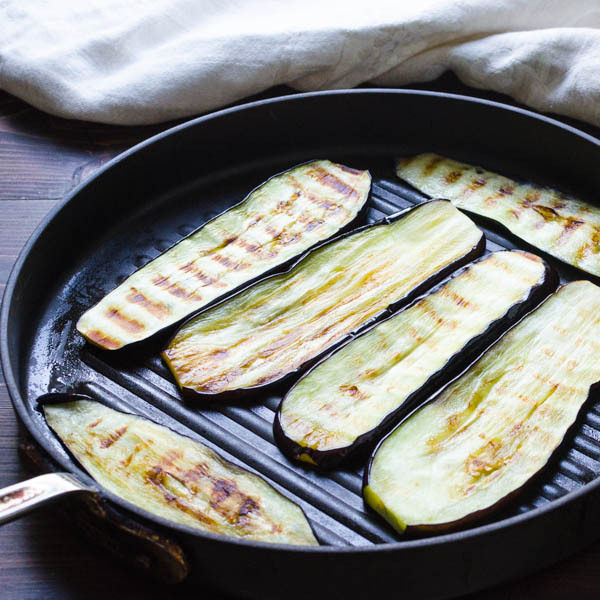 Working in batches, lay the eggplant onto the hot grill pan and cook on one side for 4-5 minutes until tender and grill marks appear. Flip the eggplant and continue to cook for an additional 4-5 minutes. Transfer to the wire rack to cool while you cook the remaining eggplant. While the eggplant is resting with the salt (step 2) make the filling. In a medium bowl, combine the cottage cheese, 1/2 cup mozzarella, 1/4 cup grana padana, the egg, salt and pepper. Stir to combine. Add the fresh herbs and lemon zest, stirring until herbs are evenly distributed in the filling. Spoon 1/4 cup of marinara sauce into the bottom of the casserole dish and spread it around with the back of a spoon. Lay a slice of eggplant (short end facing you) on a work surface. 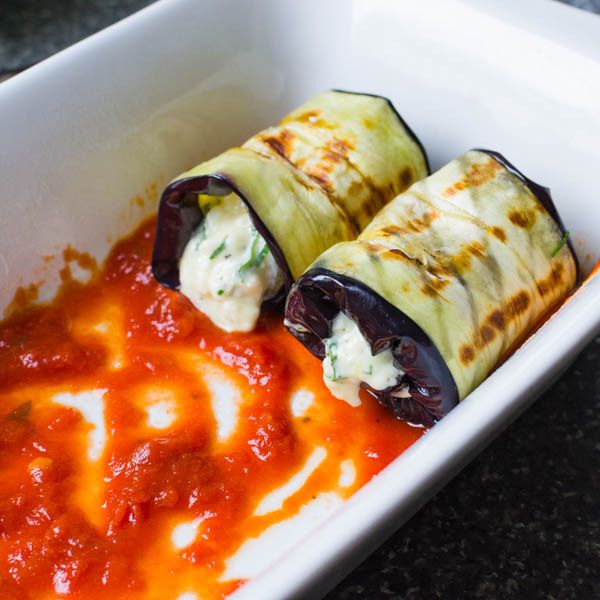 Add a mounded tablespoon of ricotta filling about 1 1/2" from the bottom of the eggplant and carefully fold the bottom over the filling and continue rolling the eggplant up into a tight roll. Transfer the eggplant to the casserole dish and continue in this fashion until you've used up the eggplant and filled the dish. Spoon the remaining marinara over the tops of the rollatini. Garnish with remaining Mozzarella and Grana Padana. 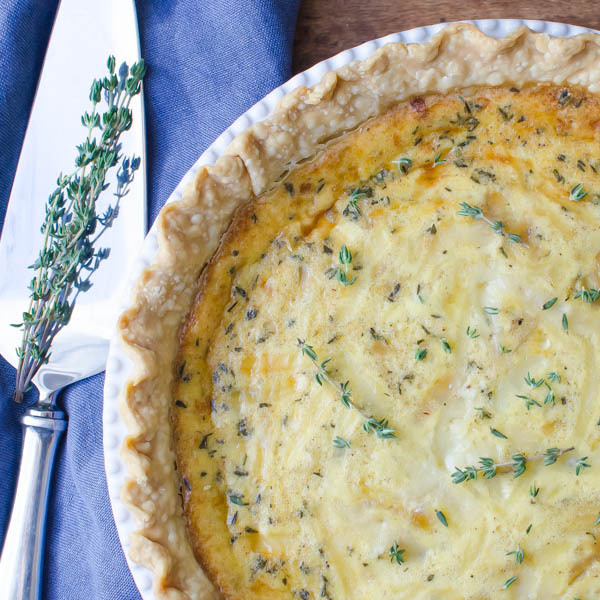 Bake uncovered for 20-25 minutes or until bubbly and fragrant. Let the dish sit for 5-10 minutes before serving. Sprinkle with more chopped basil if desired. This looks so good!! Do you think the recipe would change much if I used crookneck squash instead of zucchini? 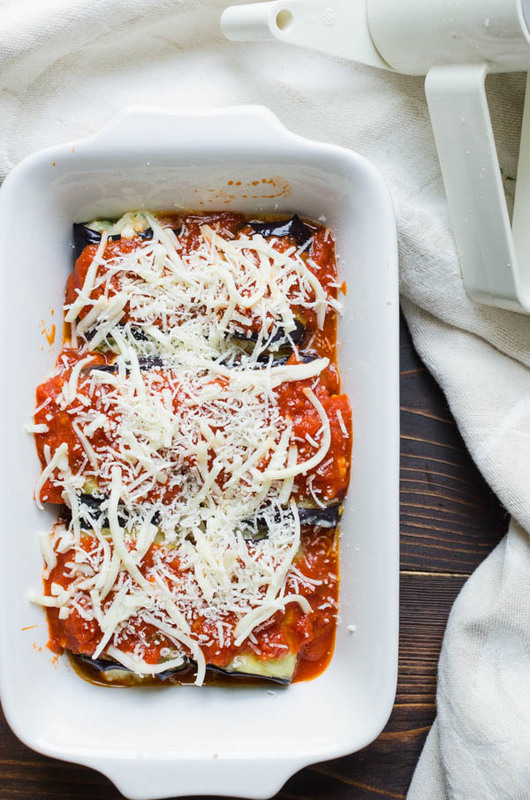 Well, it’s eggplant, not zucchini – eggplant is a little sturdier than squash – but if you wanted to use squash — I would layer it with the cheese mixture instead of rolling it… Like a squash lasagna. 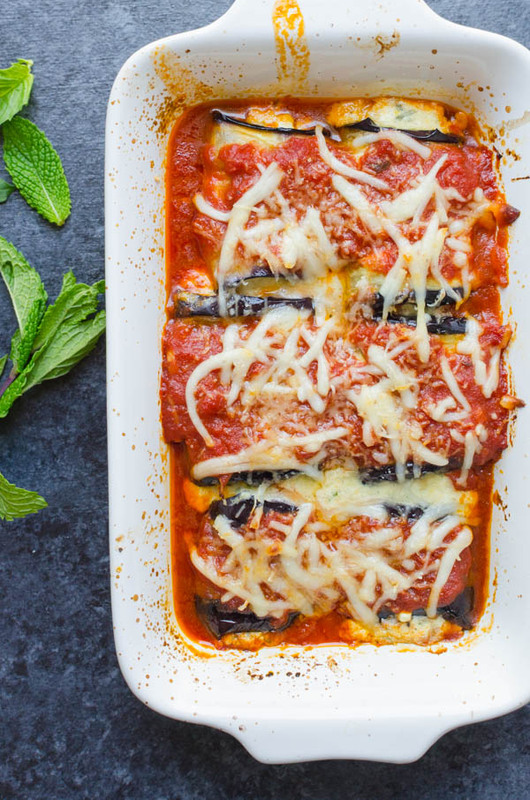 I grew up eating eggplant rollatini (my grandmother made it often), and it’s always been one of my favorites. 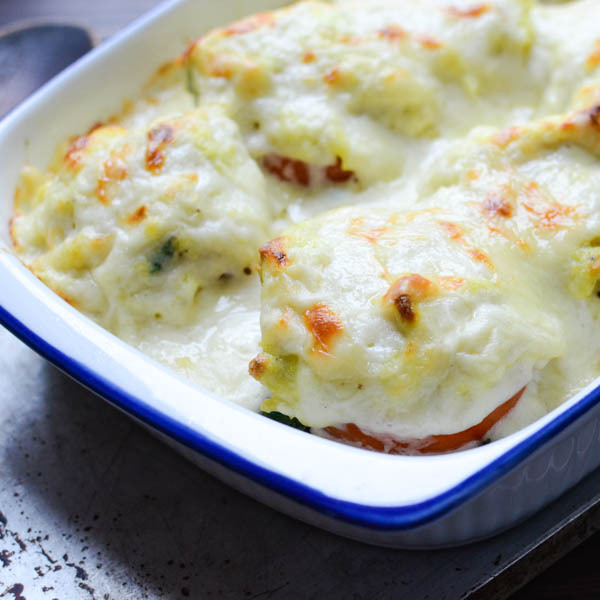 It’s lighter than sitting down to a plate of lasagna, but still an indulgent-feeling treat. I’ll have to try the cottage cheese filling sometime for an even lighter swap. 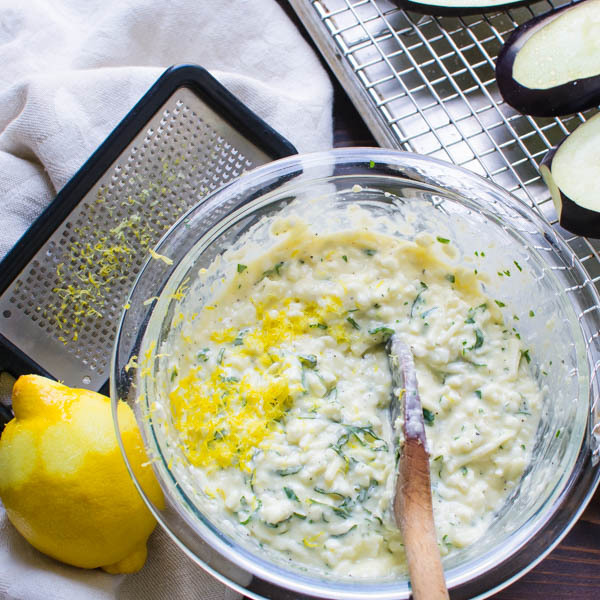 Definitely lighter than lasagna – and the cottage cheese gets a bright kick from herbs and lemon! I really appreciate your honest description of your past with eggplant because it’s so similar to how I feel about it and how my family reacts to it these days. It also gives me even greater confidence in trying this recipe as a good introductory point to incorporating my eggplant into our diets! I absolutely love eggplants and I am always looking for recipes where I can highlight their amazing taste. I love everything about this recipe and the fact that is gluten free is a huge plus! Saving this recipe to make next week. Top anything with enough cheese and sauce and even eggplant haters will love it! I will love it either way, but I can’t resist cheese and sauce either. 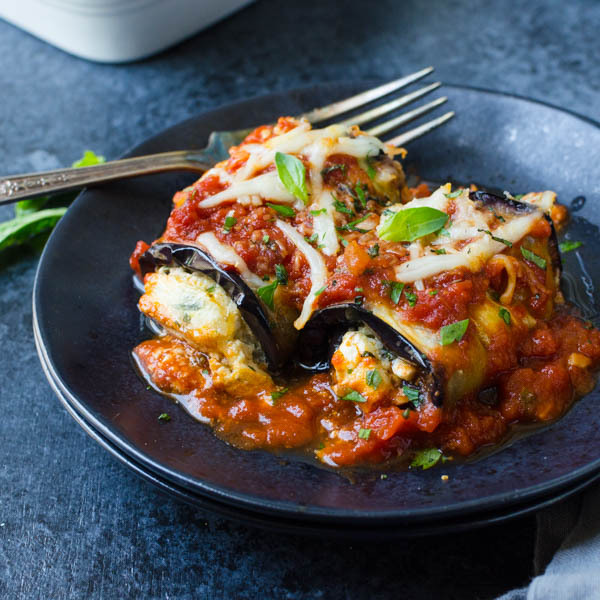 🙂 I’m glad you’re working through your eggplant aversion with such tasty rollatini since now I can try your recipe too. I am loving this low-carb rollatini version. Saucy and flavorful. I can’t wait to make it and see how much flavor grilling the eggplant adds to the dish. I can’t wait to make this! 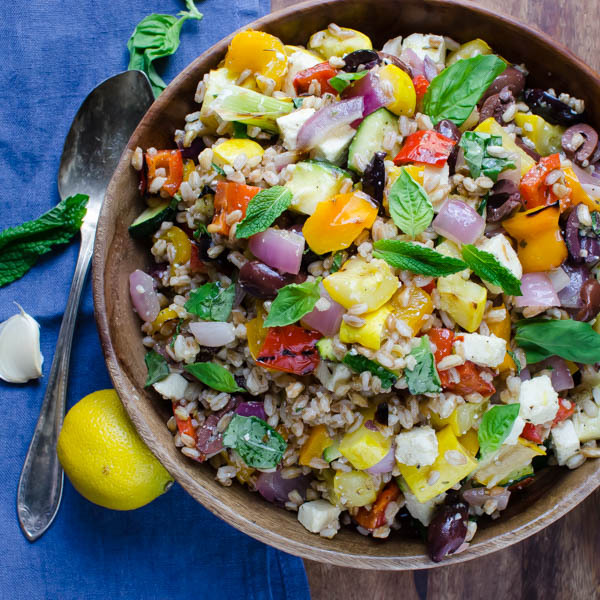 It looks delicious and with us being gluten free this is the perfect gluten free meal. My husband always complains if I serve him a meal without meat, so I think I will use my meat sauce recipe with it to avoid his complaints. I haven’t cooked with egg plant in years, so I am excited to make this. Thank you for the recipe. Funny, I didn’t even think about this as being gluten free — though it obviously is. I hope you and your husband enjoy it! It’s funny, I was just thinking of making an eggplant lasagna but this looks even better! 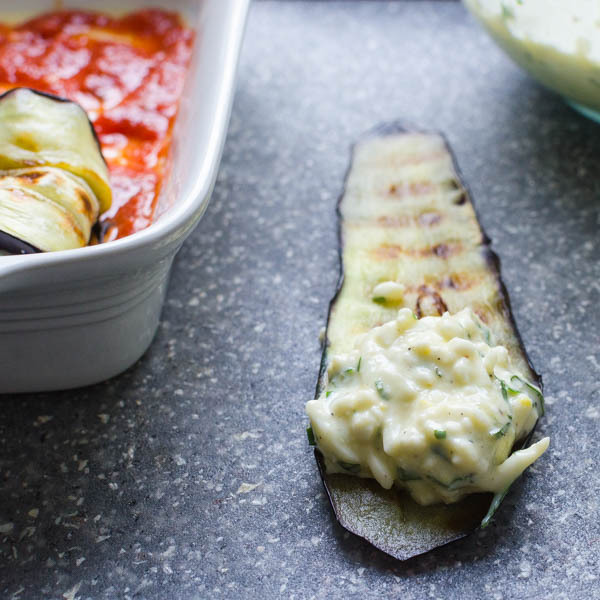 I love anything grilled eggplants and combined with all of those nice italian flavours, this recipe sound incredible! I totally get the eggplant thing. It took me a LONG time before I ate it too. My mom never cooked it (but she did have lots of Ball mason jars of other things in the cold cellar). It wasn’t until I was married (for a long time) before I started to experiment with eggplant. Today…although we do not have it often, it has grown on me. I actually have some in the fridge right now. Maybe I need to give this recipe a try!! One thing I LOVE made with eggplant is baba ganoush!! I like baba ganoush too — I think it’s the pita crisp and dip thing that does it for me. I think your hubby and mine are brothers. Not only would the site of an eggplant on the counter scare him but he would have a preconceived idea that the dinner would be bad and wouldn’t enjoy the dish. I’m definitely saving this, I would love to sneak this one in, going to have to prep it while he’s away;) It looks delicious and if we had smell-a-vision, my house would smell like an Italian restaurant right now. 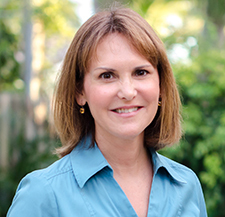 Thanks for sharing this, really liking the low carb aspect of this! Normally I’m not a fan of eggplant but I like the way you grilled them first. I think covering anything in cheese and sauce like this is okay with me! The cheese and sauce are transformative! One of my favorite dishes. Will share on pinterest. Looks very delicious. This looks really good. I am pinning this to come back to once my garden begins to produce! 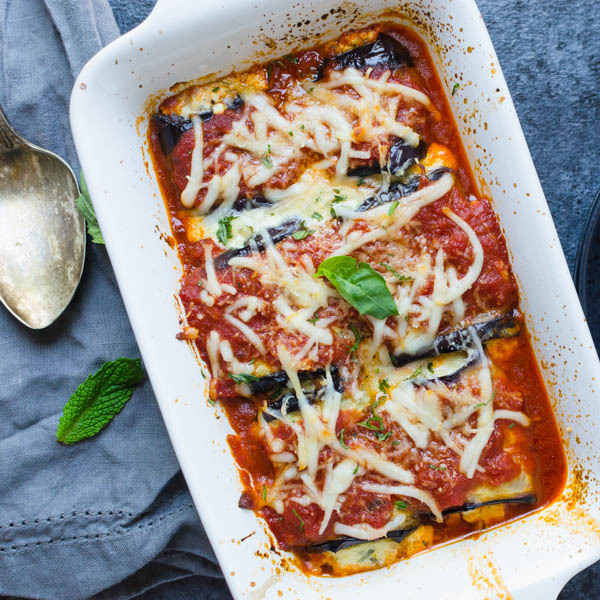 I do so love eggplant and this keto-friendly dish has me drooling! So much better than pasta rollatini IMO!